Make Mother’s Day extra special with Serenity, Balance & Whisper Blend Essential Oils. Serenity essential oil blend calms the mind, relaxes the body, and soothes the soul, providing a safe haven from life’s daily stressors. The essential oils in this must-have blend were meticulously chosen to lessen tension, calm emotions, and leave a peaceful feeling. Serenity is the perfect blend to diffuse at bedtime for a restful night’s sleep, to calm a restless baby or child, or to help reduce anxious feelings so many of us deal with. Serenity combines the soothing scents of Lavender, Marjoram, Roman Chamomile, and Ylang Ylang with the warming aromas of Hawaiian Sandalwood and Vanilla Bean to create a prized essential oil blend that every home, family, and individual needs. Add 2–3 drops into a warm bath to create a peaceful, renewing aroma. Diffuse to help promote relaxation and reduces anxious feelings. The warm, woody aroma of Balance, dōTERRA®’s grounding blend, creates a sense of calm and well-being. We perfectly blend Spruce, Ho Wood, Frankincense, Blue Tansy, and Blue Chamomile with Fractionated Coconut Oil to offer an enticing fragrance that promotes tranquility and a sense of balance. Spruce, one of the oils in Balance, was used by Native Americans for medicinal and spiritual reasons and is still used today to bring harmony to the mind and body. Ho Wood, Blue Tansy, and Blue Chamomile can soothe sore muscles and joints, promote circulation, and relax the body, while Frankincense supports cellular health and overall well-being. Begin your day by putting Balance on the bottom of your feet to lessen feelings of stress throughout the day. dōTERRA Whisper Blend for Women is a complex and diverse blend that entices the senses and combines with each individual’s chemistry to create a uniquely personal fragrance. Each essential oil in the blend provides an inviting aroma of its own, but when combined, these oils offer a distinct scent that intrigues the mind and senses to both the wearer and those passing by. Regarded as the most precious flowers in the perfume and aromatherapy industries, Jasmine and Ylang Ylang’s euphoric aromas combine with the warm and spicy scents of Patchouli, Vanilla, Cinnamon, and Cocoa to make this blend unmatched in complexity and aromatic influence. Dispense one to two drops in the palm of the hand and rub on clothing, scarves, and coats to experience its calming and blissful scent throughout the day. 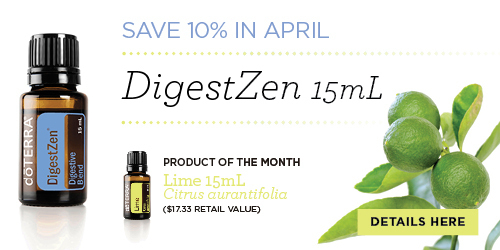 Don’t forget DigestZen (my favorite oil) is 10% off in April! DigestZen: Incredible tummy tamer can be taken internally and used topically directly on the stomach for any digestive concerns.